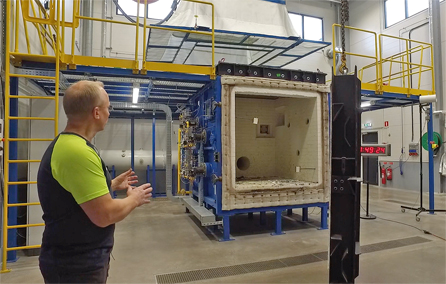 Roxtec reports that it has more than doubled its fire resistance testing capacity, opening in Sweden a new laboratory that creates conditions for continuous development of safety products. The fire lab is located at the Roxtec headquarters in Karlskrona, Sweden, and it will play a key role in the product development and pre-certification process for the sealing solutions. With the lab Roxtec engineers and technicians can prepare tests with exactness. Every test object must be tested as an entire system in a realistic environment. The test object is built, with transit installations in walls, bulkheads, floors or decks, and attached to the furnace. The process is followed closely and monitored via computers in the control room.